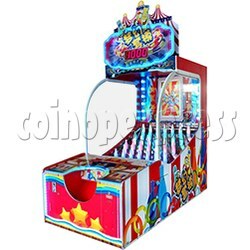 Ring Toss Redemption Machine is a ring toss game which toss the rings onto The bottles and win tickets. Attractive circus theme image, designed spacious playfield featuring 46 target bottles, and built into the 27" high-definition LCD screen on the back of the playfield to show current scoring information. Flashing LED lights surround the machine, and mesmerizing RGB LED lighting effects channel through the translucent bottles, will attract people's attention. Ring Toss is a simple game, player rings to throw onto the target bottles to win scores. Bottles that are further back are worth more scores than those that are closer, players in a limited amount of time toss the rings and get them onto as many bottles as possible, rings to throw more bottles, get more scores and win more tickets. Accumulate to a certain number of scores will activate the bonus round.